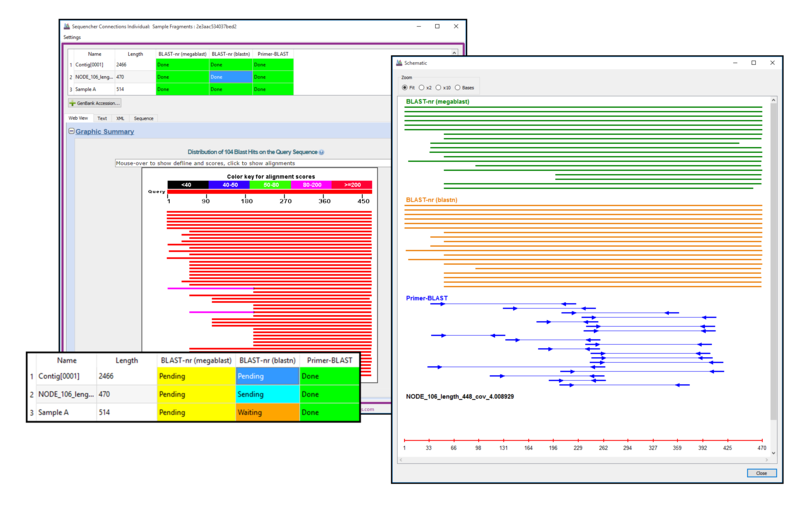 Sequencher Connections represents a new approach to performing multiple analyses on sequences or groups of sequences. 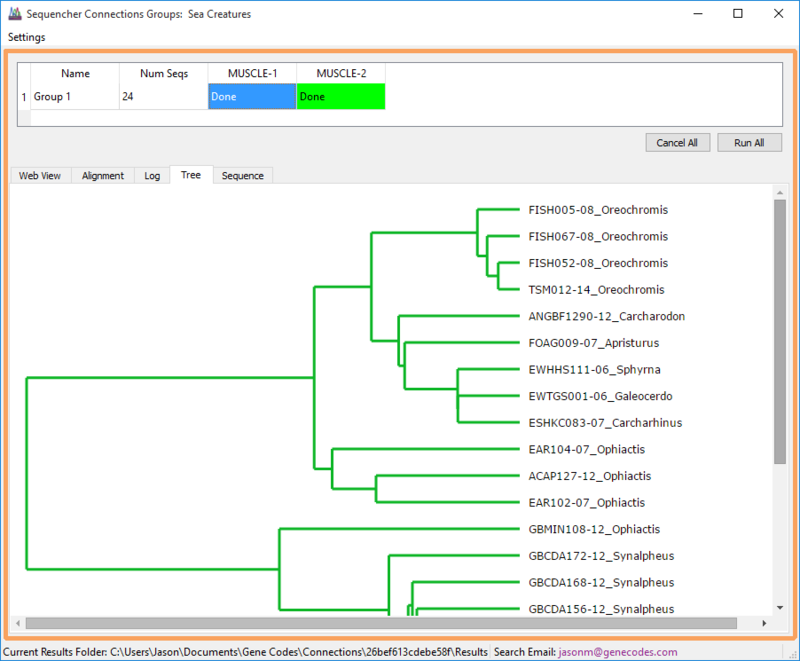 Connections has expanded the power of Sequencher by allowing you to set up “channels” on which different analyses using different parameters or databases can be run. 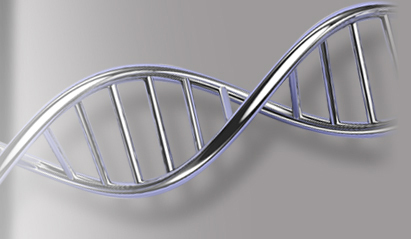 By simultaneously running analyses on multiple sequences or groups of sequences on different channels at the same time, Sequencher Connections can increase the speed with which you get results. 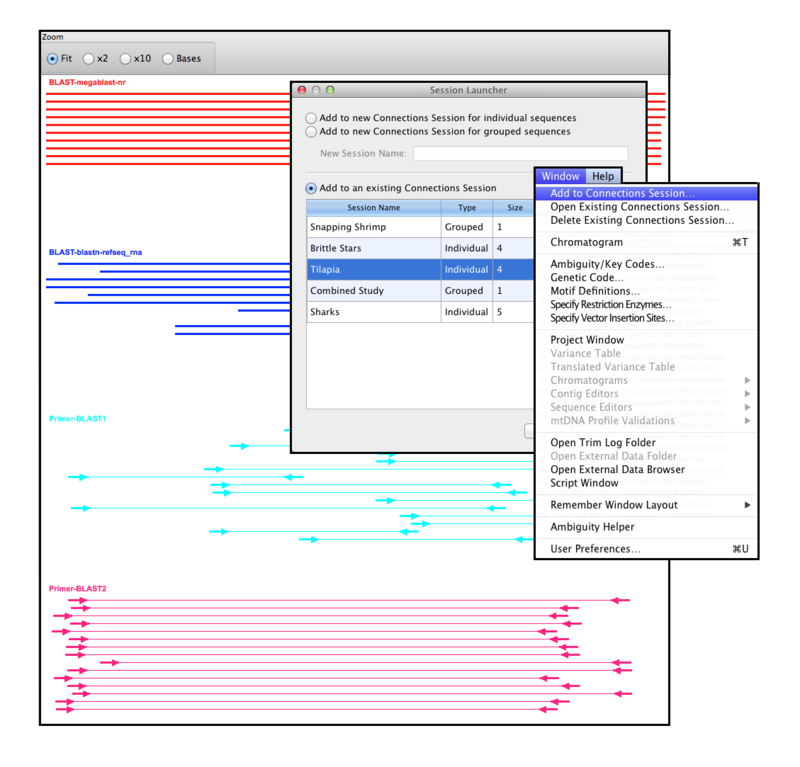 Sequencher Connections is now more flexible and customizable. Existing Connections sessions can be reopened and have new sequences added to them. Your Connections sessions can be renamed to reflect your project. There are now more options for adding channels to a Connections session and each channel can also be named. You can do BLAST searches in a Connections Session for individual sequences. Channels can be set up to search the NCBI databases with different parameters or databases used on each channel. Local-BLAST channels can be set up to search databases on your machine. You can also set up a Primer-BLAST channel to design primers over a region of interest and send those primer sequences to your Sequencher product. The primer sequences will have colored bases and the primer feature applied to them. The Schematic shows the results from multiple channels in a single window to allow you to compare the results from different runs. Your Connections Sessions are automatically saved with your project. With the new Session Launcher, it’s easy to create a new Session, add more data to existing Sessions, or simply review and re-run older Sessions to see if any new sequences of interest have been added to the databases you queried previously. Use the Schematic to provide a graphical overview of your BLAST, Local-BLAST, and Primer-BLAST analyses at the same time. The ability to have multiple Sessions open at the same time means you can view all your results with ease. 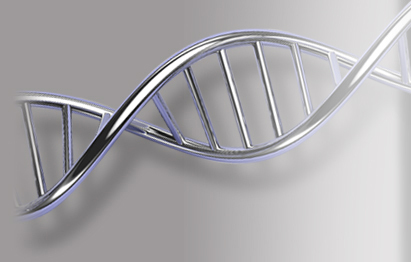 When your results finally expire from NCBI’s website, you can be sure that they will still be there safe in Connections. You can run MUSCLE alignments in a Connections Session for a group of sequences. The results can be viewed as the aligned sequences or visualized using a Phylogram. Different channels can be set up to use different parameters. Sequences can be added to an existing session, so that the different rows look at different groups of sequences. Runs on the different channels and rows can then be compared. For more information on Sequencher Connections, check out the Sequencher Connections Tutorial by clicking here.